Just like the code, we have carefully crafted t-shirts and other merchandise. 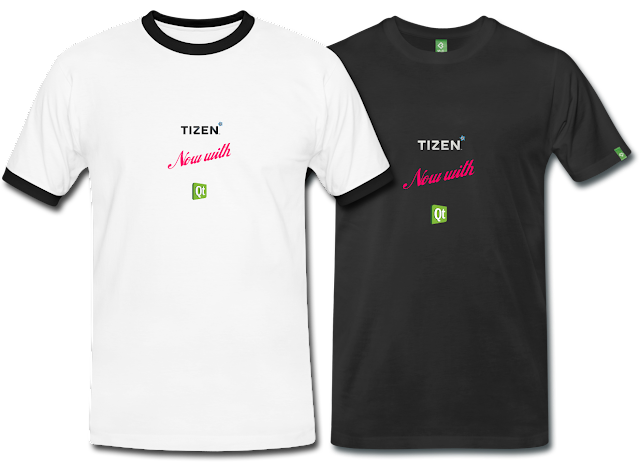 Visit qtfortizen.spreadshirt.net. Use with pride and fun! PS: You can use the MYSHIRT2013 voucher code for 15% off until 7th June and further 10-30% off for volume orders. No, we're not making money on this :) Just support us by wearing these clothes and drinking from these mugs. PS2: When making any composition like these, please read these usage guidelines for Qt and for Tizen. Qt Cinematic Experience is a famous QML application that demonstrates the power of Qt 5 and the new additions in Qt Quick 2.0. The app uses Qt Quick particles, sprites, path animations, shader effects and other cute graphical effects. Qt Cinematic Experience demo app is running successfully on two different Tizen reference devices: RD-210 and RD-PQ. Both devices have been updated by flashing Tizen 2.1 (Nectarine) and the QML app is powered by Qt 5.1 for Tizen. Hardware acceleration has been enabled on the devices by installing Mali DDK for Tizen 2.1. The frame rate is approximately 60 frames per second on both devices.